Considering that Jover Laurio, venerable blogger of Opposition website Pinoy Ako Blog, was crowned Filipino “Person of the Year” by the Philippines’ biggest broadsheet in 2017, her wedding Saturday enjoyed a virtual news blackout. Consider too that her guest list and, most notable of all, her list of sponsors is a who’s-who of Crazy Rich Filipino politicians and oligarchs, most of whom identify with the Philippine Opposition. It’s not as if the wedding was kept secret. Photos of the occasion emerged and went “viral” on social media as the festivities progressed. One of the first of these, in fact, was released on Twitter by no less than Senator Risa Hontiveros herself. The important question to ask, therefore, is How can mainstream news media NOT report the wedding of Jover Laurio? It is one of those mysteries that certain cliques of Philippine society choose not to dwell upon and only the truly curious elect to really think about. One clue as to why Big Corporate Media seem to be colluding to effect this blatant media blackout is — get this — top honchos of the industry’s biggest corporations were, themselves, guests in this affair. A who’s-who of media and ‘journalism’ honchos gracing the affair seem to be complying to some sort of News Blackout Directive. Notable amongst the guests were GMA News Network exec Howie Severino, former Inquirer Digital editor-in-chief John Nery, and, of course, Rappler CEO Maria Ressa. One can’t help but further deepen one’s understanding around why the Filipino public have all but lost confidence in their mainstream media to deliver relevant news. 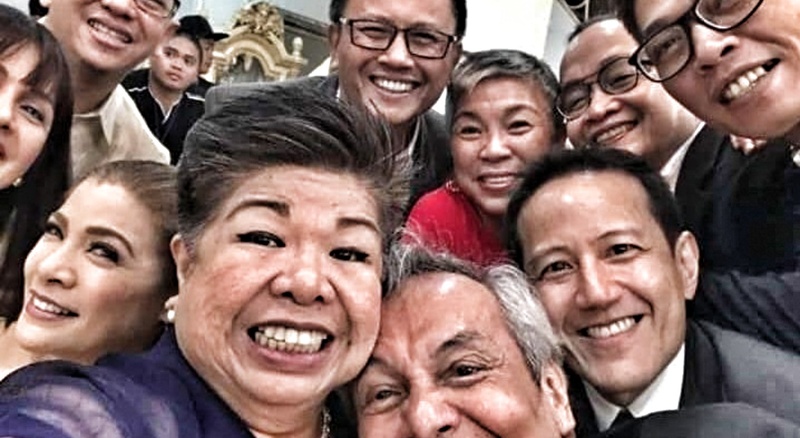 In the case of Laurio’s Wedding of the Year, the top honchos seem to have had a meeting of the minds to decide that this event is not relevant to Filipinos. But is the wedding of the Philippines’ Person of the Year of 2017 really that irrelevant as these captains of Philippine journalism had decided amongst themselves? More importantly, is this occasion — one that was attended by a highly-representative cross-section of the Philippine Opposition community — not newsworthy? Perhaps Laurio, by herself, is not newsworthy. But in combination with other things going on, she is part of a story that is important to an electorate set to go out to vote in a critical election year — one that will determine the fate of a new path for Filipinos current President Rodrigo Duterte is blazing. Connecting the dots (among which Laurio is just one), the bigger story that has rivetted Filipinos emerges — one that could be told in just one paragraph. Kris Aquino, a major celebrity that is a driving force of the Philippine Opposition’s campaign machine, was found to be funding Facebook “boosts” of Jover Laurio’s Pinoy Ako Blog (PAB) which styles itself, according to its title, as one representing “Pinoys” in general. The revelations follow a falling out between Aquino and her now-former business manager, Nicko Falcis who had since admitted to being the implementor of Aquino’s PAB-funding activities. Aquino represents a key vanguard of the once-preeminent “yellow narrative” of the Aquino-Cojuangco clan. Since the downfall of this narrative in 2016, the Opposition have attempted to distance themselves from this yellow brand. Right there in that one paragraph lies a compelling premise that truly investigative journalists can work with and build an infinite array of combinations and permutations for series of articles and reports that can run for the rest of the campaign homestretch. This is a story Mainstream News Media seems to be reluctant to tell. Thus we shouldn’t be surprised if, yet again, real citizen journalism fills that artificial void. So stay tuned. It’s an election year. There are lots of stories to be told — many of them hiding under no-go-zones that the Philippines’ news media cartel have imposed upon themselves and, as a result, are effecting a deliberate misleading of the Filipino public. Since Kris “the tulo” Aquino, was financing Jover Laurio’s Pinoy Ako BlogSite. She may had financed also Jover Laurio’s wedding. And, she might had acted as the matchmaker. I presume, the bridegroom, may have “financial incentives”, to marry Jover Laurio. Of course, it was not a “shoot gun wedding”. Do you agree ? The ‘blushing bride”, is smiling for her conquest ! Are you telling me it wasn’t covered by either DreamWorks or National Geographic?? Grumpy Old Man Tatang Jim Paredes leading the pack ! no dilated ojos/nostrils/ boca y arched eyebrows? The Vice President was there too! Kris and PNoy could have gone too surreptitiously. The problem is, Jover, no matter how you twirl her around, from any angle or by any aspect, is plain, mediocre, undistinguished. Her blog is shallow, extremely biased and bigoted. That the opposition find themselves congregating around her— because there is no one else— says a lot. This “event” was never about the bride and groom, Jover Laurio’s wedding was a public platform for dysfunctionals.